Netflix makes secret “test” films. I discovered this a few years ago through InstantWatcher, which aggregates all films added to Netflix on any given day. Here, for your entertainment, is “Example Show,” presumably used by Netflix to test some aspect of its TV streaming. For those who can’t watch: It’s nonsense. First, a twenty second time-lapse of a random building. Then a full minute of a bubbling fountain—a medium shot followed by a close-up. A hand reaches in and touches the water. Skipping forward, there are shots of trains going by, a shot of the moon, a man dribbling a soccer ball... you get the idea. There’s no substance. “Example Show” is ten minutes of stitched-together B-roll—vaguely pleasant, inoffensive, and ultimately empty of meaning. Much the same could be said of Unravel. 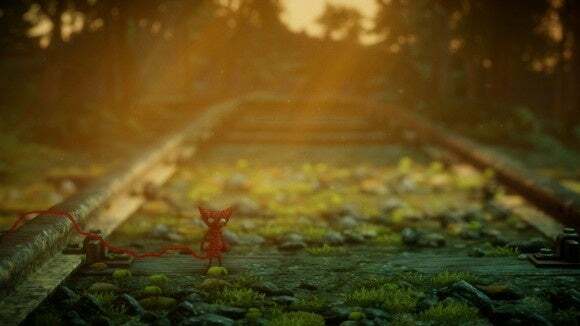 Sometimes Unravel is cute. Sometimes it’s beautiful. Most of the time it’s a humdrum puzzle-platformer. You play as Yarny, a knitted doll who decides he’s tired of living in grandma’s boring ol’ house and goes on an adventure. Unfortunately for Yarny, he accidentally snagged his intestines on something on his way out the window. Thus he is constantly hemorrhaging a trail of red thread wherever he goes. The same dark magic that brought Yarny to life also allows him to replenish his yarn supply at various checkpoints, though. This is the “puzzle” part of this puzzle platformer. You need to make it to the next checkpoint without using an arbitrary amount of thread. What it actually means: A lot of tedious backtracking. Yarny uses his guts for everything—building bridges, operating pulleys, and (most often) swinging off pegs like Tarzan with a horrific hernia. Fun fact: A human’s intestines are approximately twenty feet long. 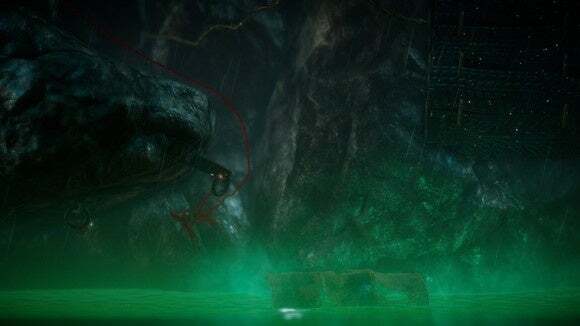 Anyway, many of these actions require Yarny to tie a knot in his slowly-dwindling intestines—say, to push a can over a rock so Yarny can stand on it and reach a higher ledge. Rarely are these “puzzles” at all difficult to figure out. What is difficult is remaining patient when the game then forces you to go back and untie all those damn knots because otherwise you can’t make it to the checkpoint. Try not to lose your temper when you’re mere centimeters from the next yarn-granting checkpoint and see an emaciated Yarny start pulling at his stomach, wordlessly whining that he can’t go even one more step unless you go back and undo a knot you foolishly left tied, or go over that [random decorative element] instead of underneath it. And I do mean random. 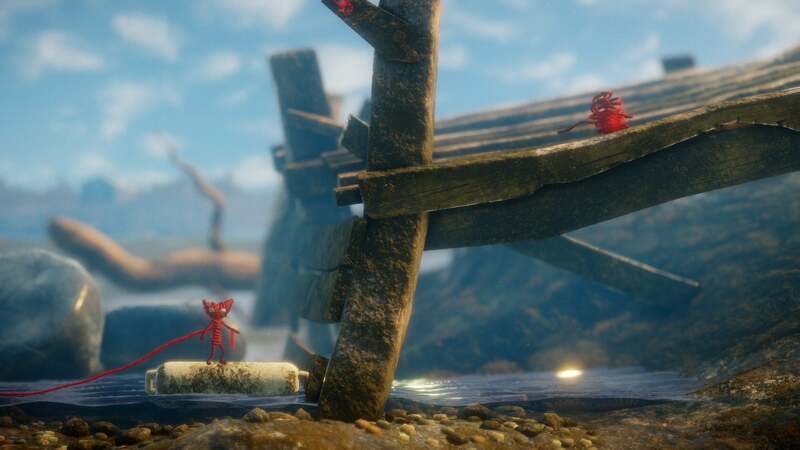 Unravel is broken up into ten stages, each with its own theme. The forest level! The winter level! The...toxic waste level? Two toxic waste levels, actually. Much of Unravel is concerned with—I think—the effects of time on a family, on aging and loss and (possibly) dementia. None of this is especially well-conveyed, but I’m pretty sure that’s what I gleaned from it by the end. It’s hard to follow though, given the game has barely any structure to it. Story is conveyed, at best, in winks and nudges. Walking through the forest you might suddenly see a ghostly apparition, a man and woman hiking. Later you might see a kid playing in the sand or something. Imagine looking through the photo albums (or Instagram, for the young’uns) of a total stranger. Or, better yet, imagine looking through a collection of stock photos and trying to assemble a story from them. That’s Unravel. And we haven’t even talked about those toxic waste environs yet! 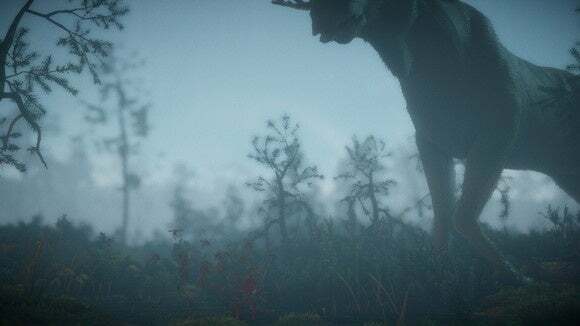 I was willing to accept Unravel as a soporific, confused trip through a grandma’s photo album, but midway through the game the story takes a turn and focuses on the dangers of nuclear waste or big business or global warming or...I can’t really fathom it, to be honest. 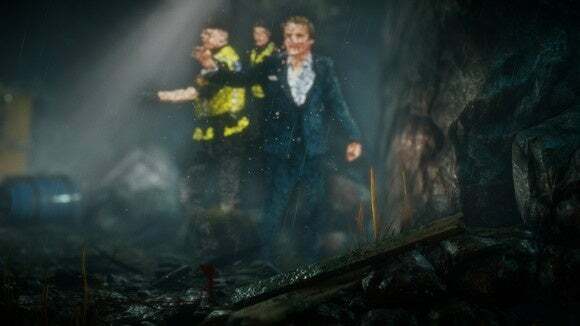 All I know is Yarny needs to avoid the massive puddles of radioactive green goo while ghosts of suited businessmen appear briefly in the background. Damn it, Mr. Suit Guy and your loyal construction minions. Think of the yarn-children. The levels themselves are admittedly beautiful to look at. As with The Vanishing of Ethan Carter I suspect photogrammetry might’ve played a hand, leading to a level of ultra-realism rarely seen in games, let alone small indie titles like this. But they’re empty. They play at life, at emotion, at having “something to say” without really saying much at all. Two weeks ago I went to a doctor and they told me it might be cancer. Not a thing anyone wants to hear. I came home, told my editor I’d probably take a few days off work, and then launched Unravel. Why? Because I wanted to think about literally nothing at all. Apologies to those who hate me or my writing: The doctor thinks it’s probably (probably) not cancer. Hopefully I’ll be around for a while to come. I still think Unravel is a tedious game. Unravel looks beautiful, but it's ultra-slick sheen with nothing much to say. Faux-emotional, if you will.